An accident caused by another person’s carelessness can be a devastating, stressful, and overwhelming experience. Dealing with your injuries and the difficulties they cause to you and your family is challenging enough. Navigating the justice system and gathering evidence to support your case is where the assistance of an attorney may be critical. 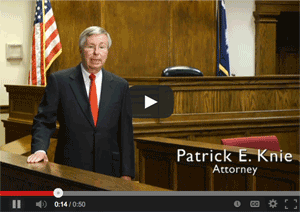 For over 40 years, injury lawyer Patrick E. Knie has provided knowledgeable guidance to accident victims in Spartanburg and the surrounding communities. At the Patrick E. Knie Law Offices, our team consists of seasoned legal professionals as well as capable experts and investigators whom we regularly consult. Although resolving your dispute through a settlement is often the fastest and least stressful way to obtain the compensation you deserve, sometimes it is necessary to go to trial. We have tried hundreds of cases to verdict throughout South Carolina in both state and federal courts, and we know what it takes to prepare for the courtroom. Although each type of accident presents different circumstances, the legal standard that you must meet to recover damages for your injuries is similar in most cases. First, the plaintiff must show that the alleged wrongdoer owed the victim a duty of care. This is a legal standard that dictates how each of us must conduct ourselves as we go about our daily business. Every individual and entity is required to act with the same ordinary care that a reasonably prudent person would use under similar circumstances. After a car accident, for example, the plaintiff would have to show that the at-fault driver failed to operate his or her vehicle with the same ordinary care that a reasonably prudent driver would use under similar circumstances. This standard takes into account the road conditions and weather patterns that were present at the time of the accident. If the collision occurred at night during a rainstorm, the standard of care would require a reasonably prudent driver to drive at a safe speed and to use his or her headlights. After establishing that the defendant owed a duty of care to the plaintiff, he or she must show that the defendant’s conduct failed to rise to the level of that standard. There are many ways in which this may happen. Using the same example, if the defendant was driving excessively fast during the nighttime rainstorm and failed to use his or her turn signals when changing lanes, the defendant’s conduct likely would constitute a breach of the duty of care. After establishing duty and breach, the plaintiff must prove that the defendant’s lack of care was the direct cause of his or her injuries. Like the standard of care, causation is a legal concept that has been developed over time. A defendant’s breach will constitute the legal cause of the plaintiff’s injuries if the plaintiff can demonstrate that he or she would not have suffered injuries but for the defendant’s breach. The accident also must have been a reasonably foreseeable result of the careless conduct. The plaintiff finally must provide evidence identifying his or her damages. If the victim suffered severe injuries requiring hospitalization, he or she may produce copies of the medical bills that were incurred during that time. Other examples include physical therapy, lost income, pain and suffering, and property damage. Unfortunately, many unexpected accidents occur while we are at work. Many parts of South Carolina are highly industrialized, putting people who work in these occupations at risk. The workers’ compensation system was created to provide employees with benefits and support when they suffer injuries on the job. The system, however, can be very complex and has many legal intricacies. The amount of benefits that you may receive for an injury depends on several factors, including the extent of your harm and how long your symptoms will last. If your injury constitutes a partial disability and your doctor anticipates that it will only be temporary, for example, you will be awarded a shorter benefits period. If your injury constitutes a total disability preventing you from ever returning to work, you will typically receive a larger benefits award and have other options made available to you to cope with the situation. Whether you have been hurt due to a careless driver or a job-related accident, personal injury and workers’ compensation attorney Patrick E. Knie is here to help. We serve Spartanburg residents as well as other individuals throughout South Carolina, including in Greenville, Union, Cherokee, and Laurens Counties. Call us now at 864-582-5118 or contact us online to set up a free consultation.